Heat oven to 375ºF (350ºF for dark or nonstick pan). Grease 12-inch pizza pan or bottom only of 13x9-inch pan with shortening or cooking spray. In large bowl, mix cake mix, butter and egg with spoon until crumbly. Press on bottom of pan. In medium bowl, beat yogurt and pudding mix (dry) with electric mixer on medium speed until blended. Spoon over baked layer. Smooth surface with rubber spatula. 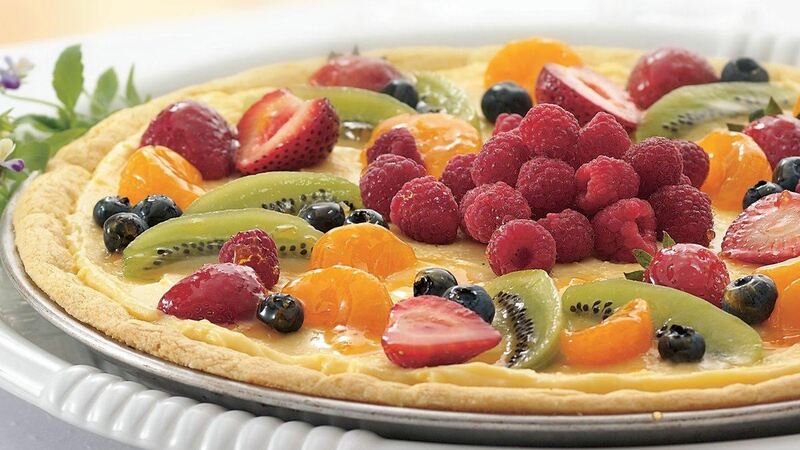 Arrange fruit on yogurt mixture. Heat preserves over medium heat until melted; brush over fruit. Mound raspberries in centre. Serve immediately, or refrigerate up to 24 hours. Store covered in refrigerator.